A BRIDE FOR RIP VAN WINKLE played the New York Asian FIlm Festival last year. With the film hitting theaters Friday here is a slightly modified repost of that review. When I was descending into Asian film with wild abandon Iwai Shunji's SWALLOWTAIL BUTTERFLY was held out to be the be all and end all of Japanese film by several people I know. It was a film I was verbally and almost physically attacked for not liking (and you thought fanboys are tough today). Despite several attempts at the film it has never clicked with me. 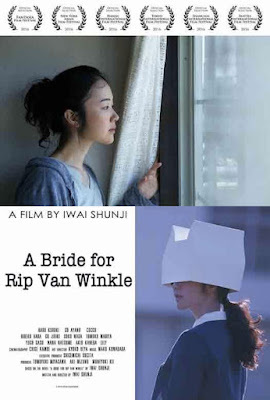 A BRIDE FOR RIP VAN WINKLE vexes me. A film of great beauty and occasional stunningly wonderful moments, the film more frequently seems to skid off in self indulgent navel gazing. Sequences that seem to be firing on all cylinders are followed one ones where the film seems to just be idling and letting things play out way past the point they need to. Apparently nothing since there are two versions of the film and the the full 179 minute one is hitting US screens. It's a film that runs a full hour longer than shorter version which is also played at the same time in theaters in Asia. This full version is exactly what Shunji wanted to release and reaction to the cut is either gushing love or similar to mine-which is "it's got moments".